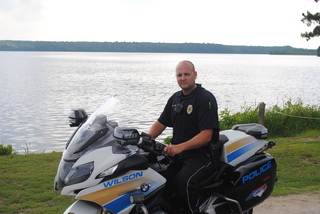 Officer Justin Cox has been employed with the City of Wilson Police Department for nine years. Officer Justin Cox has been assigned to the traffic unit since 2010. During this time he has completed several traffic related courses and obtained his Traffic Specialist Certificate. Officer Justin Cox attended the N.C. Highway Patrol Basic Motor School where he obtained his certificate.